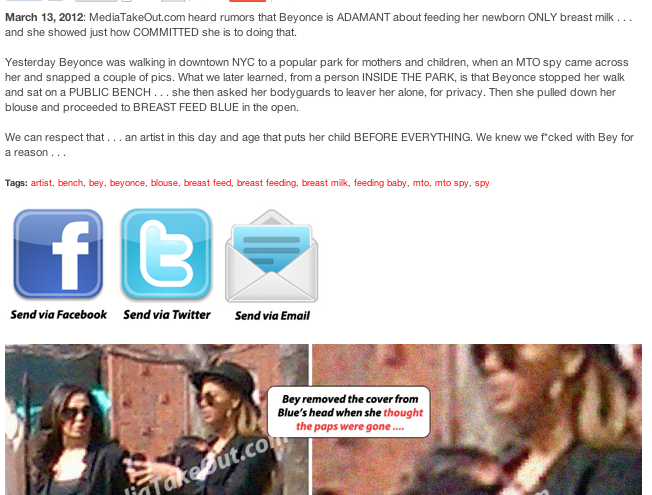 "MediaTakeOut.com heard rumors that Beyonce is ADAMANT about feeding her newborn ONLY breast milk . . . and she showed just how COMMITTED she is to doing that. Yesterday Beyonce was walking in downtown NYC to a popular park for mothers and children, when an MTO spy came across her and snapped a couple of pics. 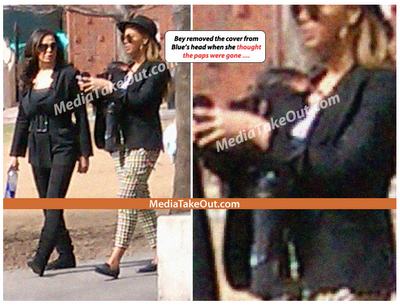 What we later learned, from a person INSIDE THE PARK, is that Beyonce stopped her walk and sat on a PUBLIC BENCH . . . she then asked her bodyguards to leaver her alone, for privacy. Then she pulled down her blouse and proceeded to BREAST FEED BLUE in the open.We can respect that . . . an artist in this day and age that puts her child BEFORE EVERYTHING. We knew we f*cked with Bey for a reason . . ."